I must admit at the moment I am not a dog person, it isn't that I don't like them I am just too busy right now. I do however love your story... I assume you have seen the movie, or read the book, Marley and Me...no impact the first time, but the second time I watched I cried my eyes out.. go figure. 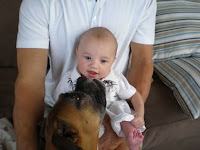 Dogs are way better'n people. 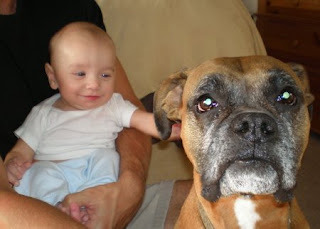 The look that the toddler was giving the dog -- that is priceless. I totally just started tearing up. 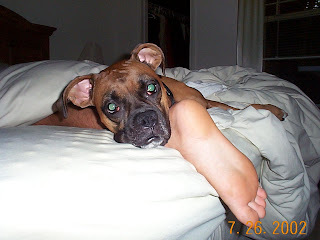 We have a boxer, Oscar who exhibits all the same temperament. He can thank you because tonight he's sleeping on the bed.